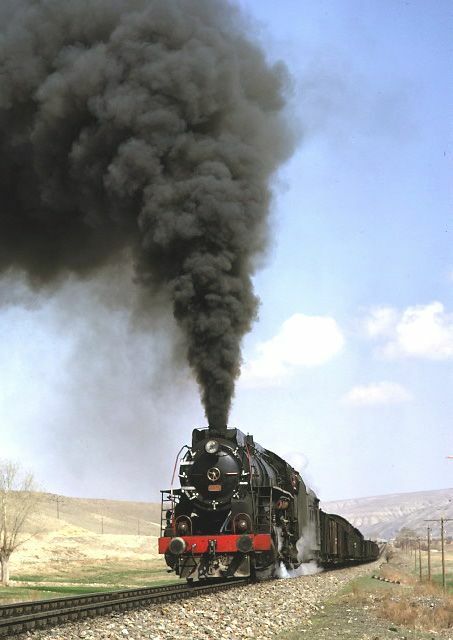 Click on the thumbnail to open the full size picture. 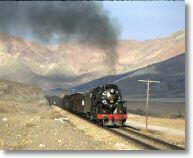 Copyright: rights to all pictures on this page reserved to Robin Lush. 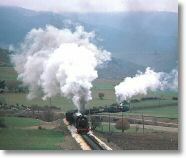 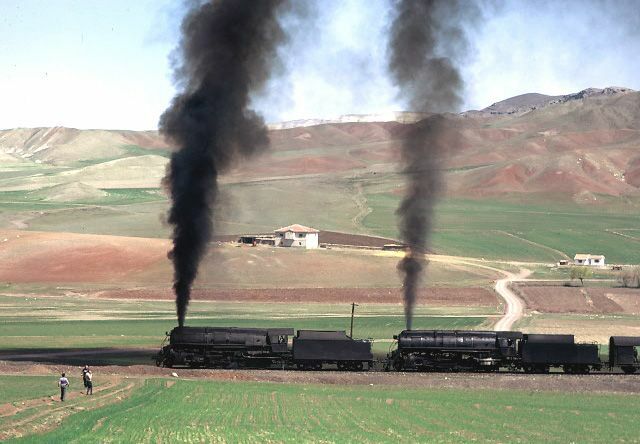 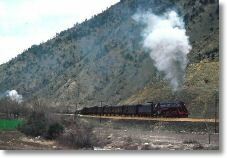 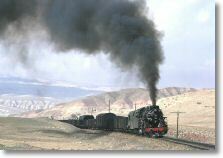 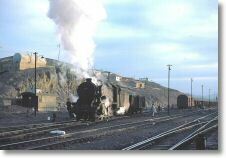 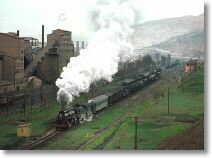 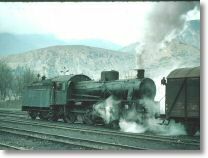 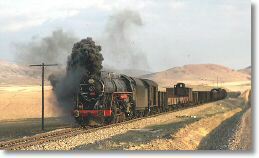 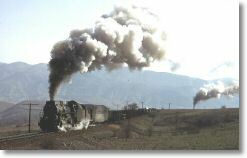 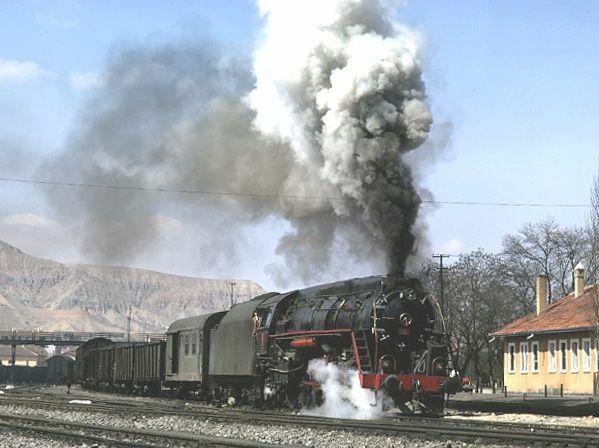 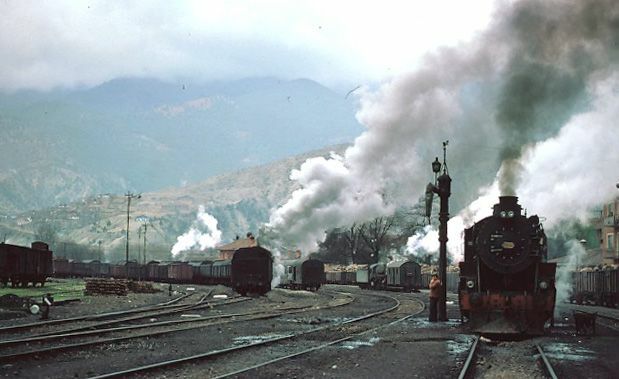 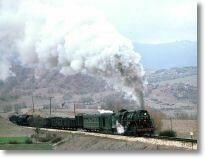 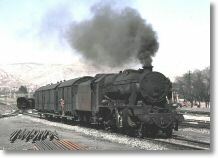 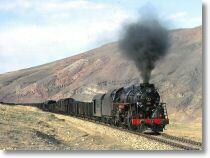 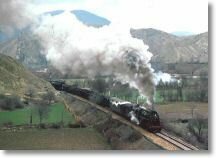 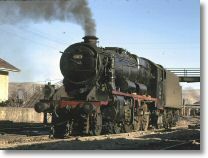 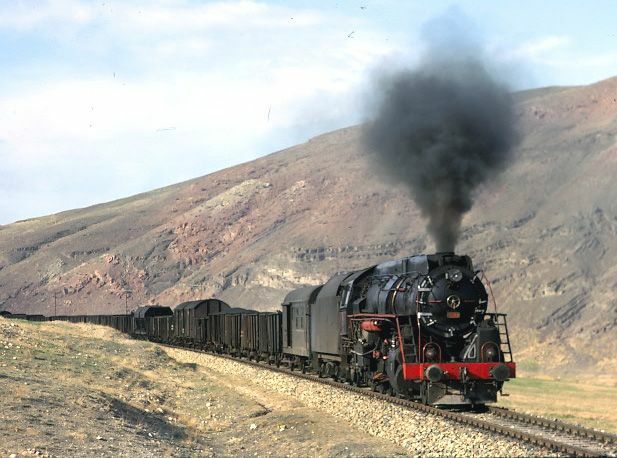 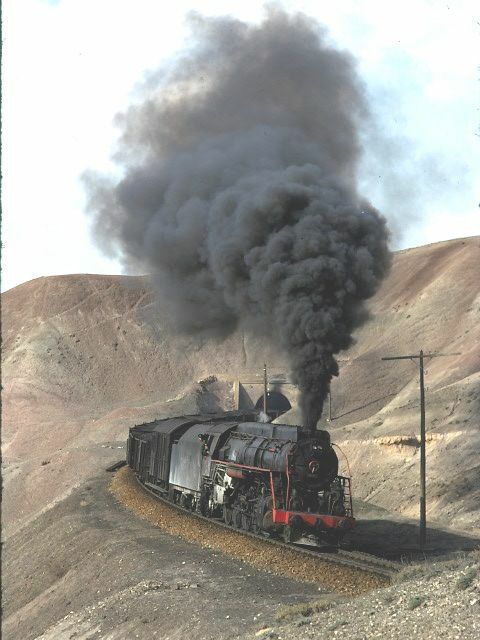 56380 leaving Çankiri. 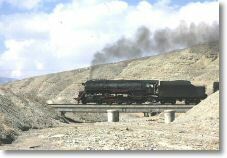 30 March 1974. 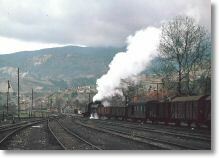 56380 near Germece. 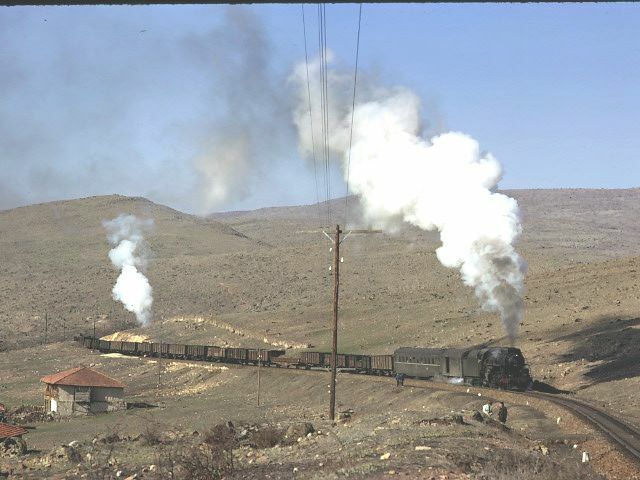 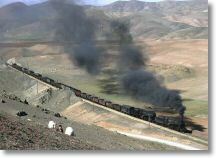 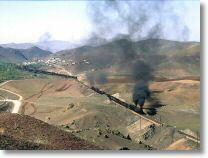 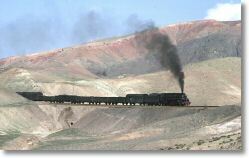 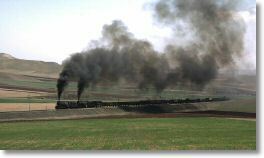 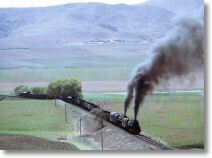 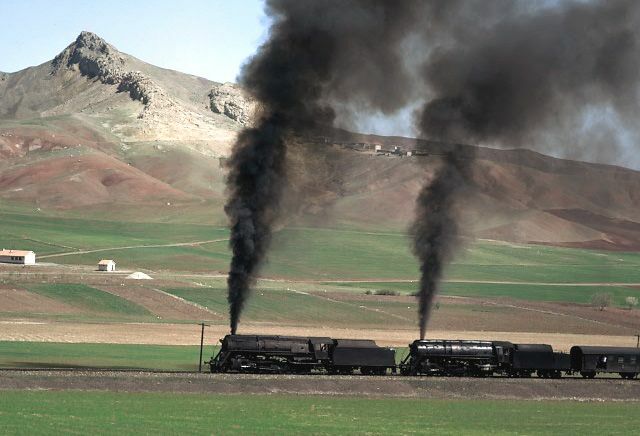 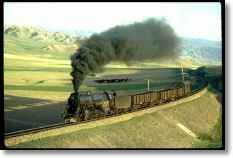 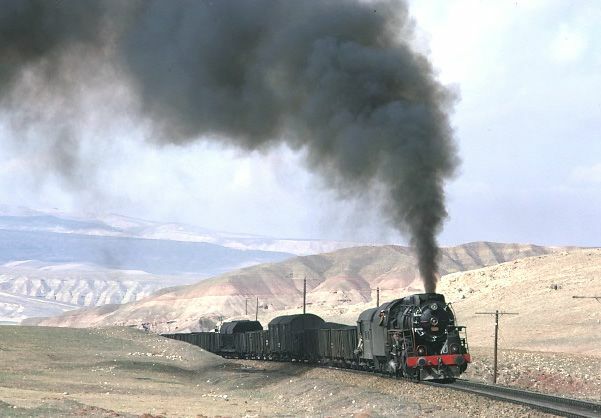 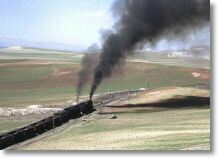 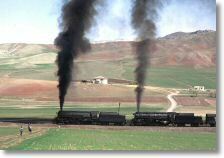 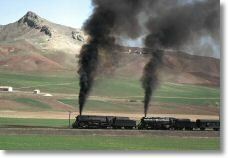 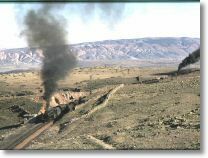 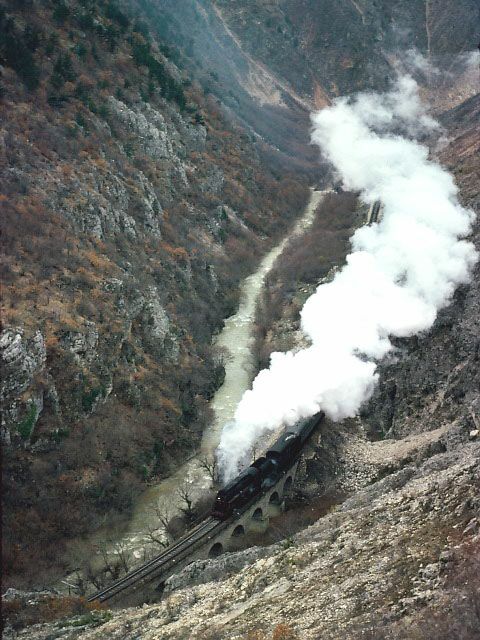 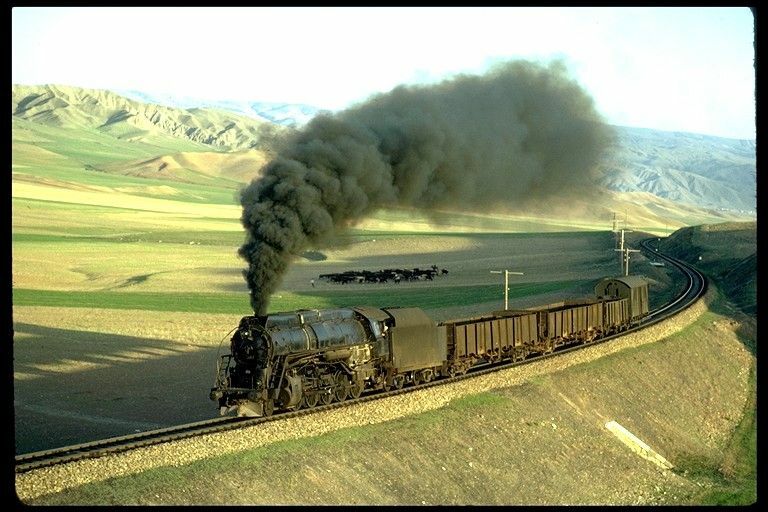 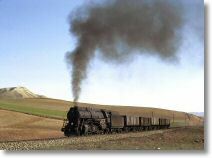 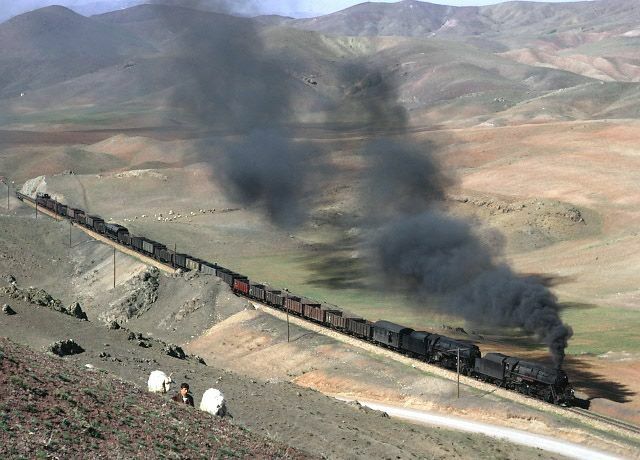 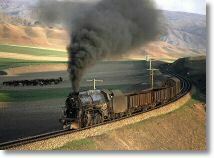 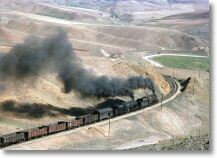 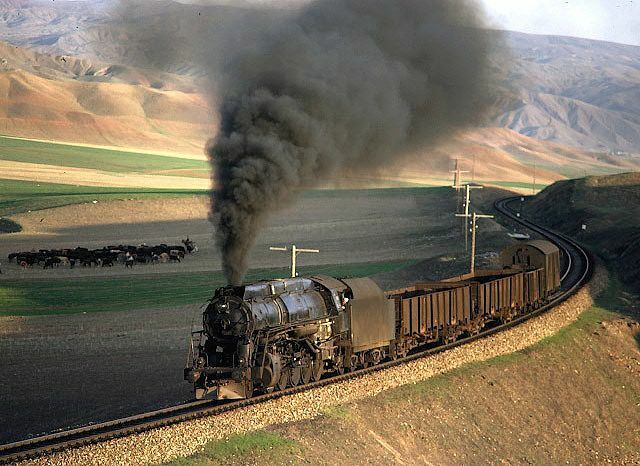 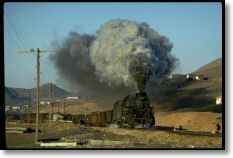 The same train heading south towards Irmak. 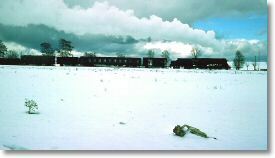 30 March 1974. 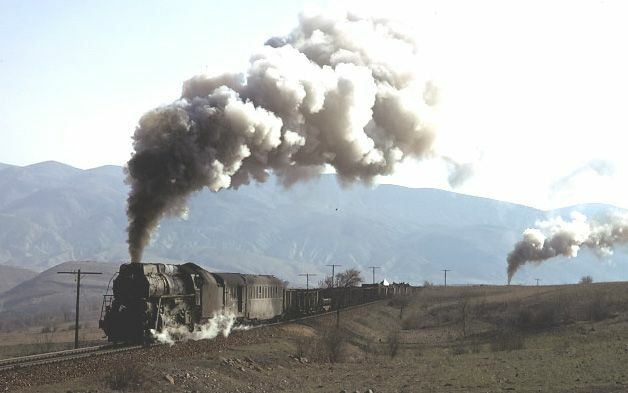 Vulcan 2-10-0 plus another banking near Korgan 30 March 1974. 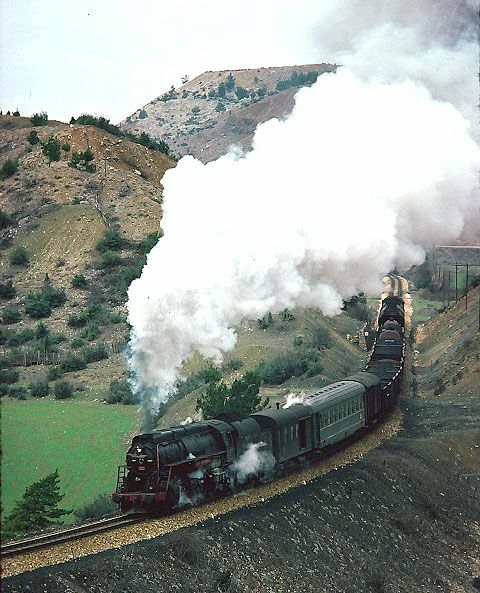 This time to the north of Çankiri an unidentified skyliner struggles northward. 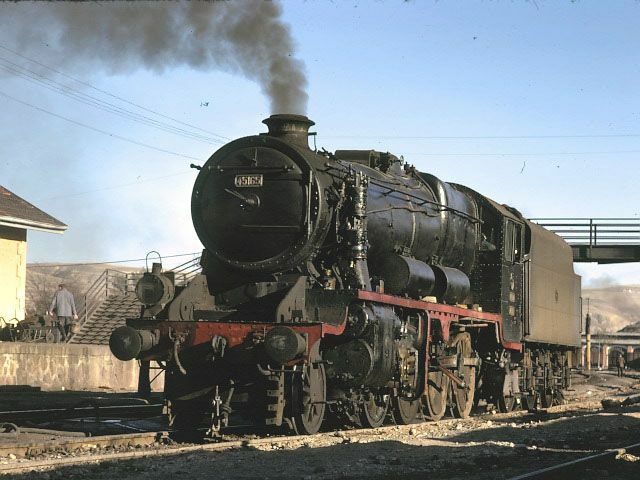 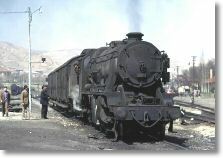 45165 at Çankiri 30 March 1974. 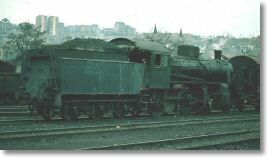 The right hand side of the loco with fewer modifications visible. 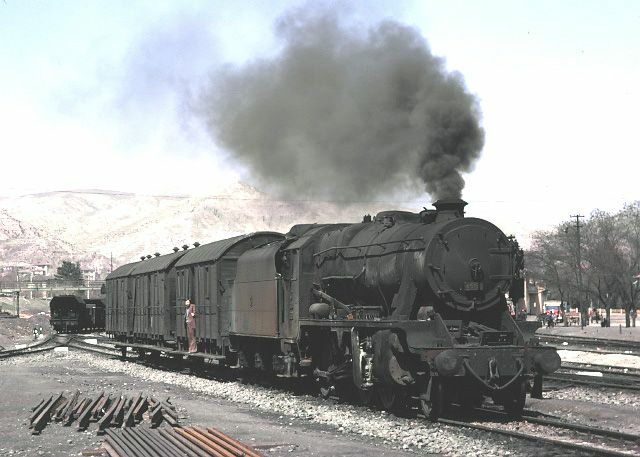 45165 at Çankiri 30 March 1974. 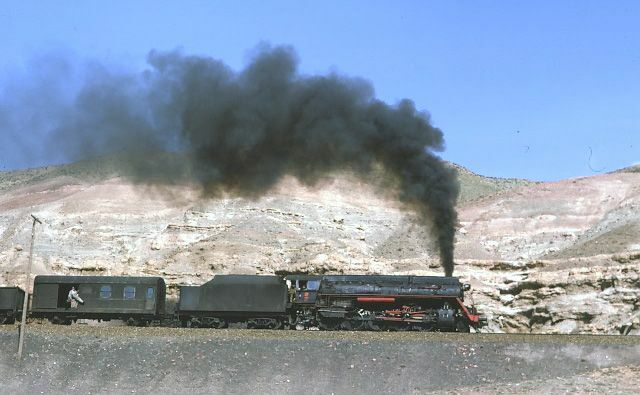 Same loco viewed from the traditional front three quarter angle. 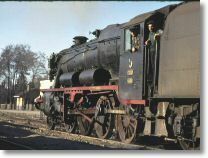 Notice the engine has been cleaned but not the tender. 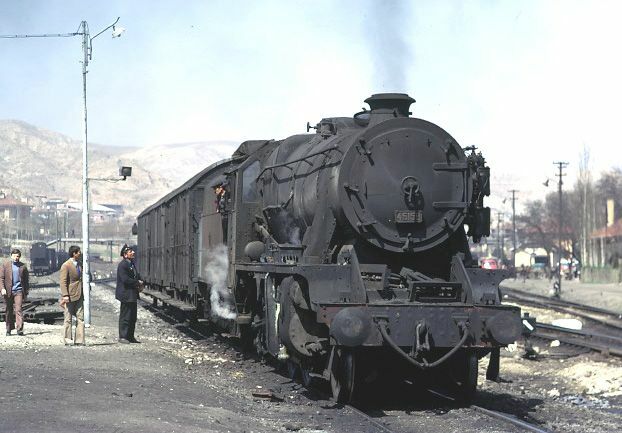 45165 at Çankiri 30 March 1974. 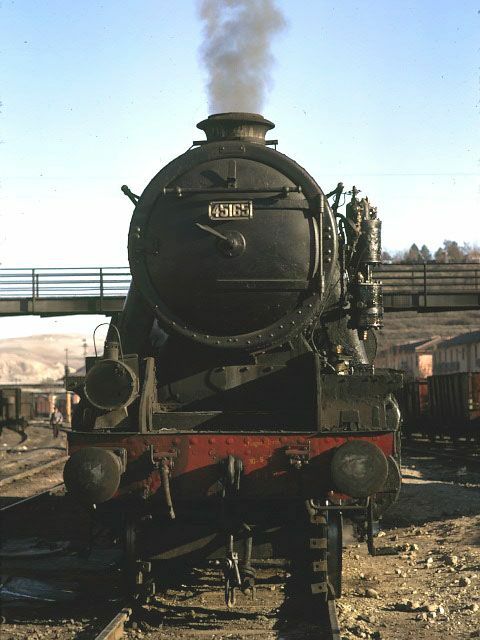 56341 on Çankiri shed 30 March 1974. 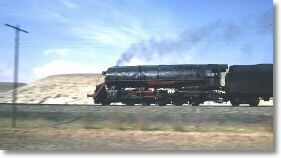 A Skyliner preparing to leave shed about the same time as we were being ejected. 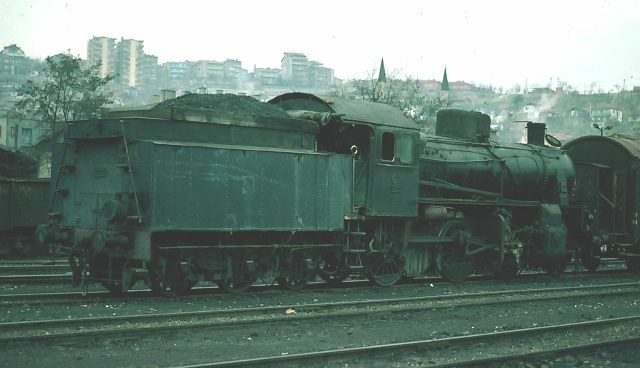 Derelict 2-6-0 on Çankiri shed 30 March 1974. 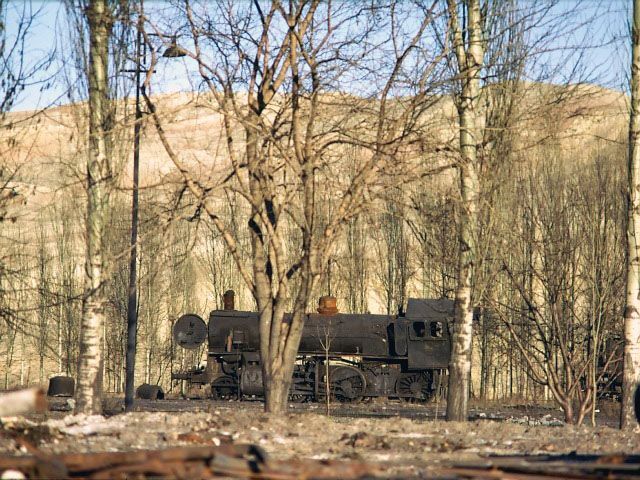 Dumped among the trees at the back of Çankiri shed. 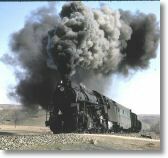 This engine is from the 34000 - 34018 series, it has lost the sand dome and its casing. 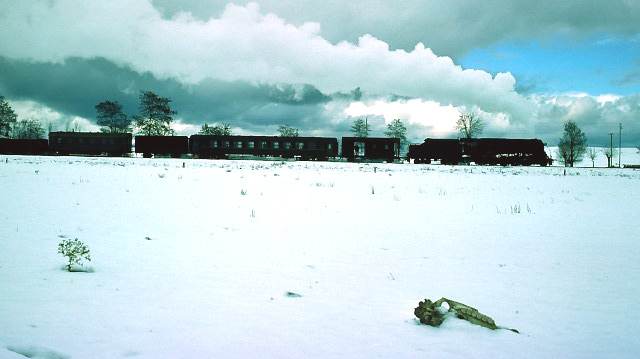 Skyliner near Dümbelek 30 March 1974. 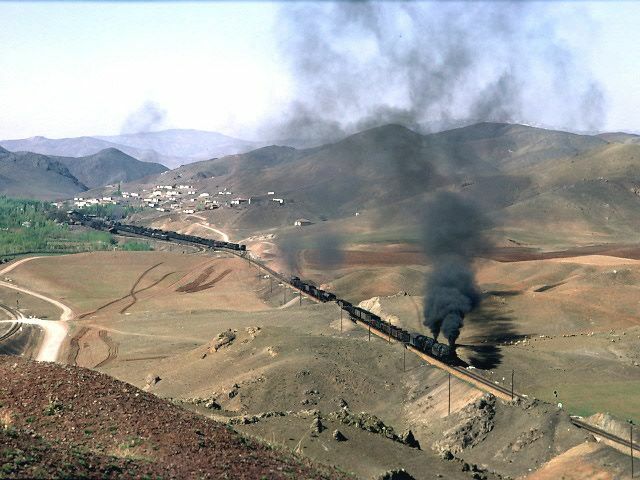 Skyliner near Korgan banked by a fellow class member. 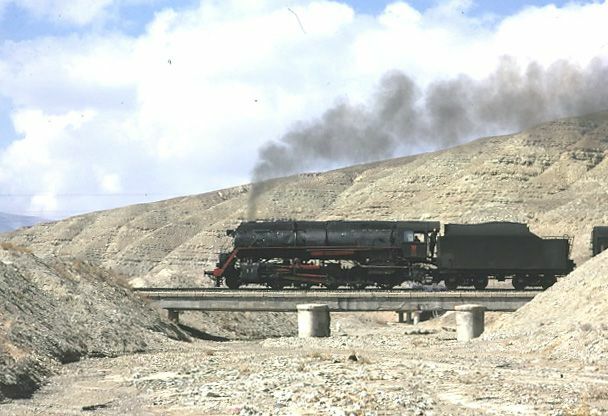 4 April 1974. 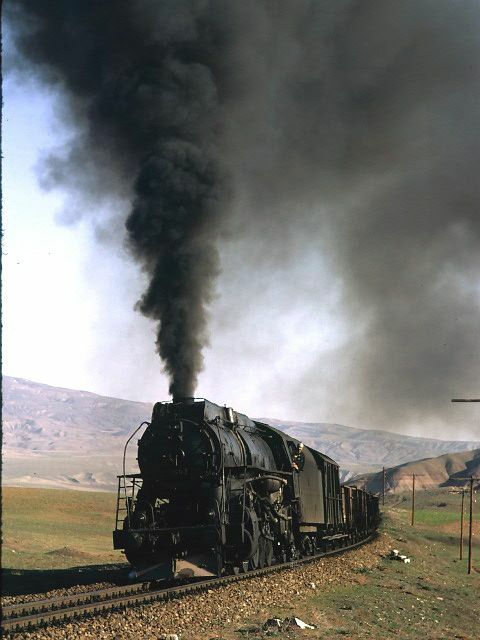 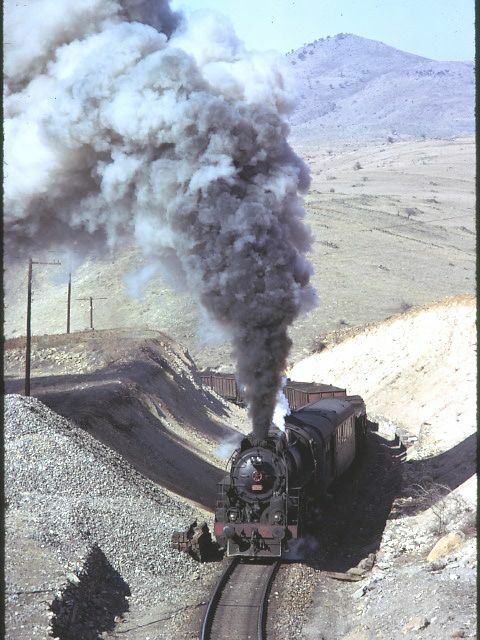 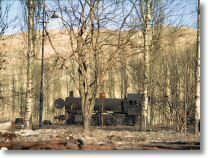 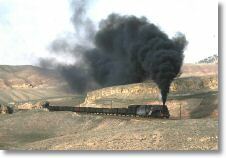 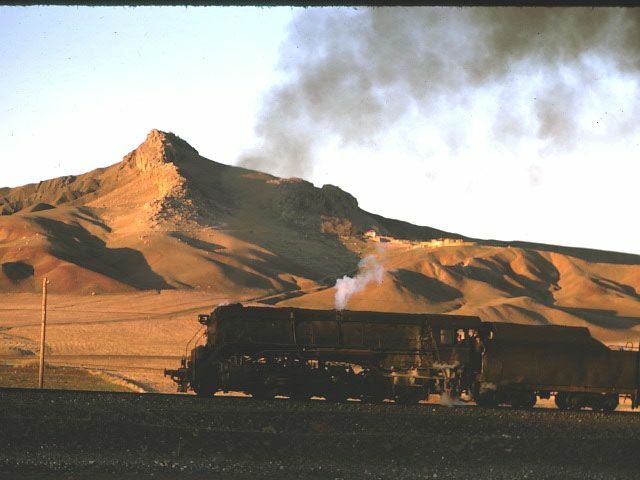 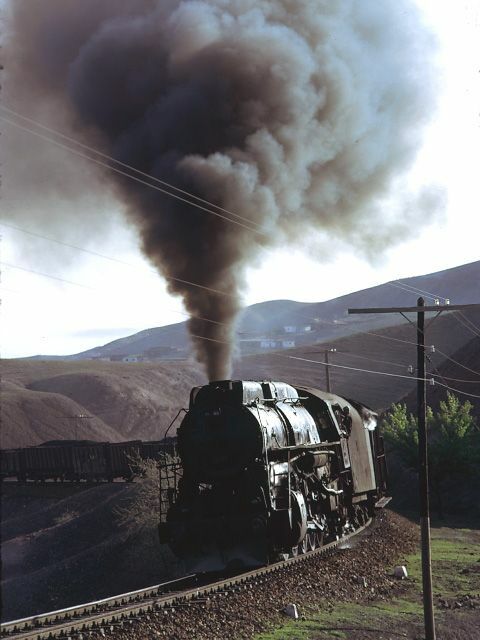 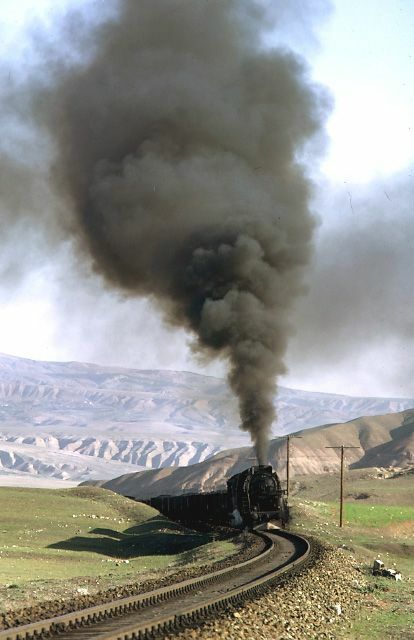 56374 near Korgan 4 April 1974. 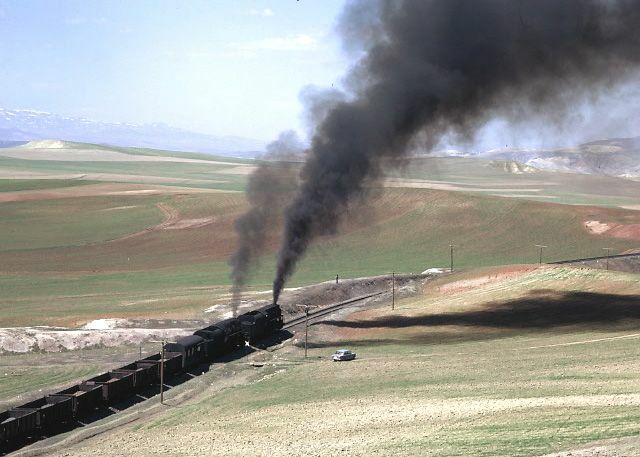 We found this northbound skyliner on a high embankment north of Çankiri. 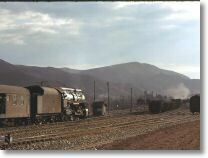 56374 near Korgan 4 April 1974. 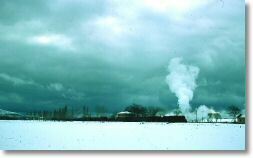 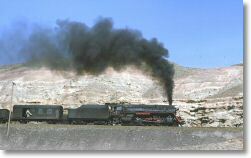 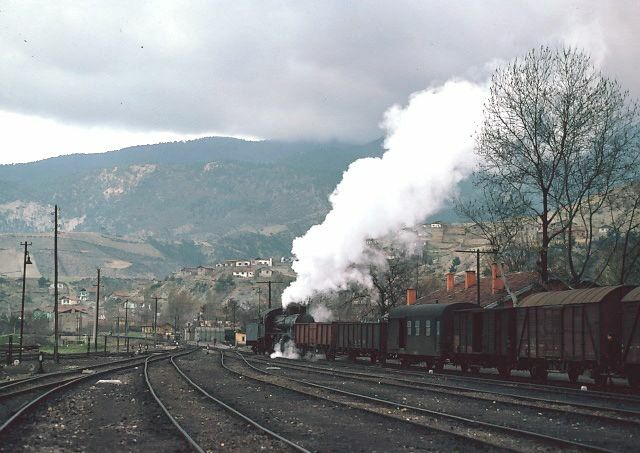 We struggled to find a position, which would show the banking loco in the picture. 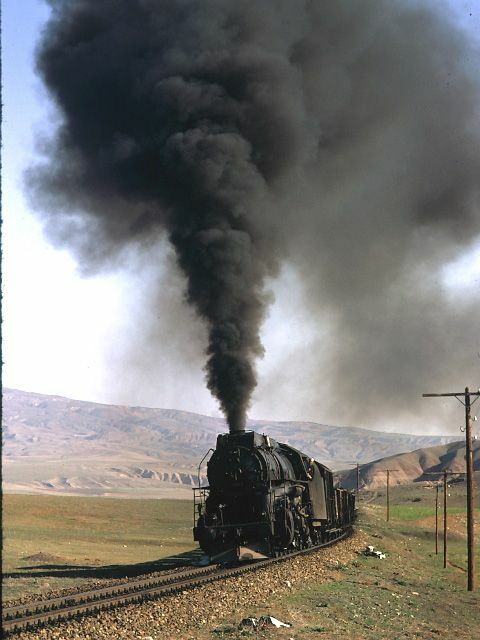 56374 near Korgan 4 April 1974. 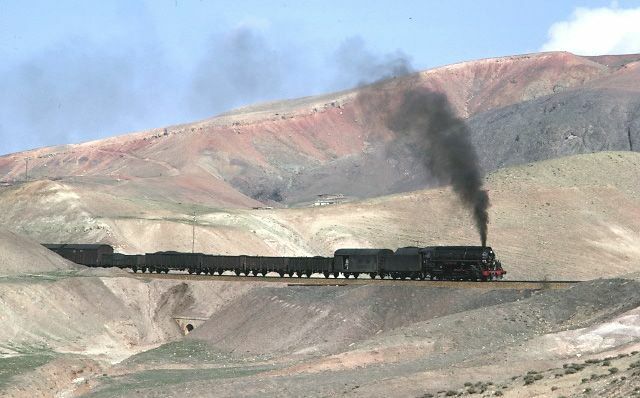 Near the summit of the climb we can just about get the whole train in the picture. 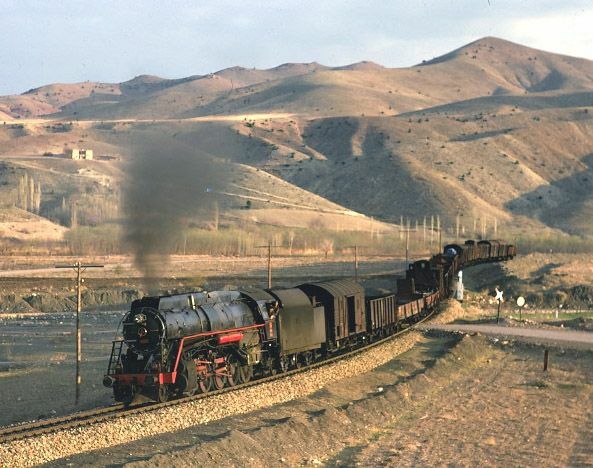 56374 near Korgan 4 April 1974. 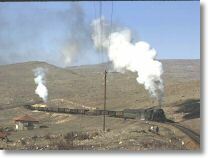 Closer view from the same spot. 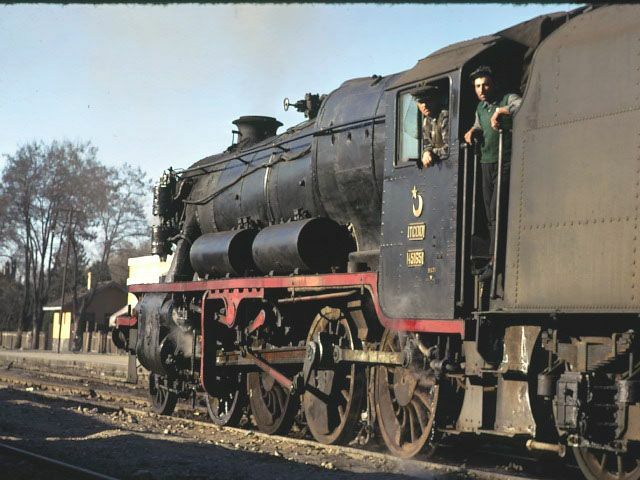 Back to Çankiri to find a British built 45158 shunting. 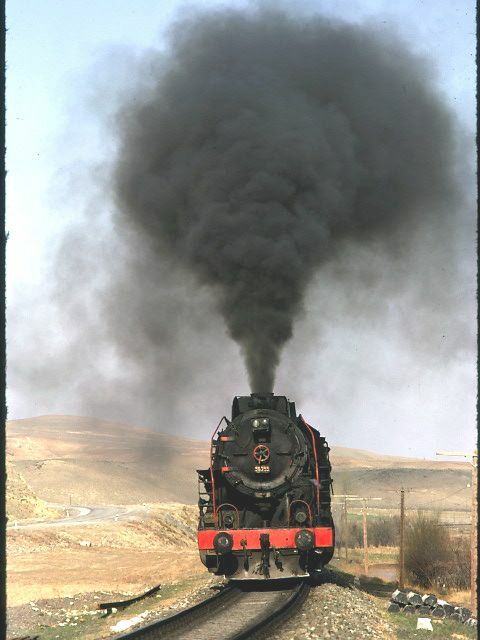 4 April 1974. 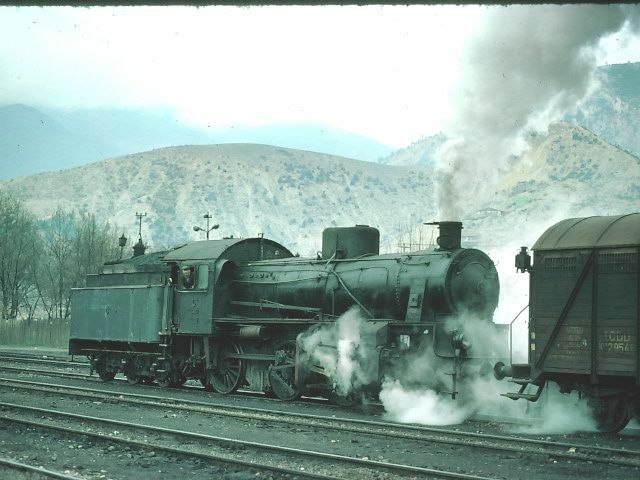 45158 shunting at Çankiri 4 April 1974. 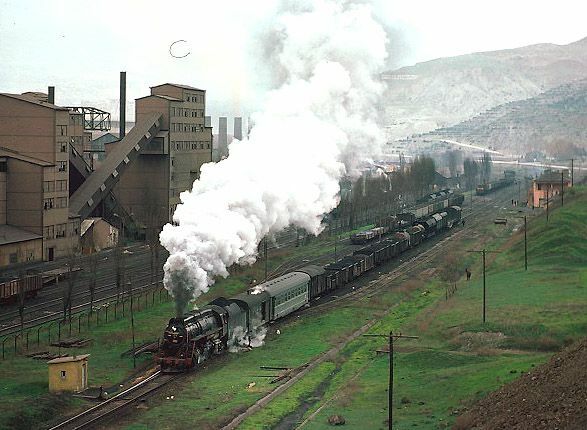 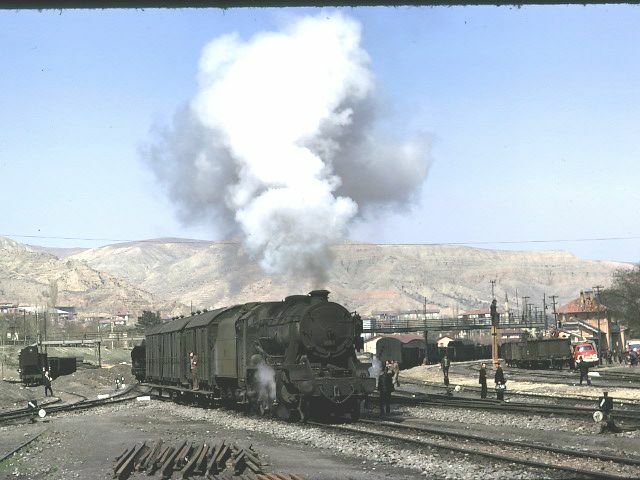 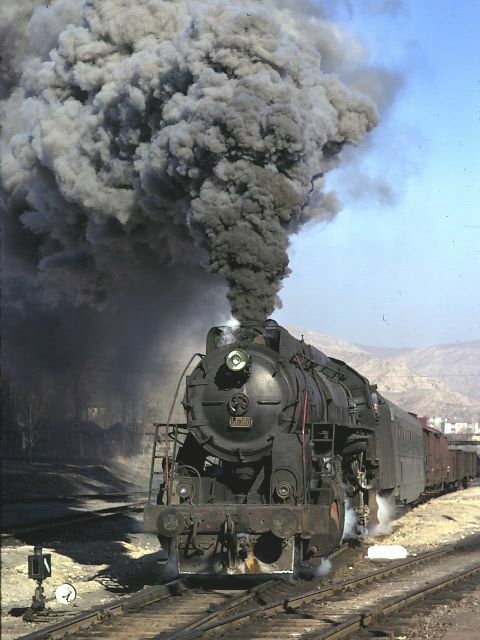 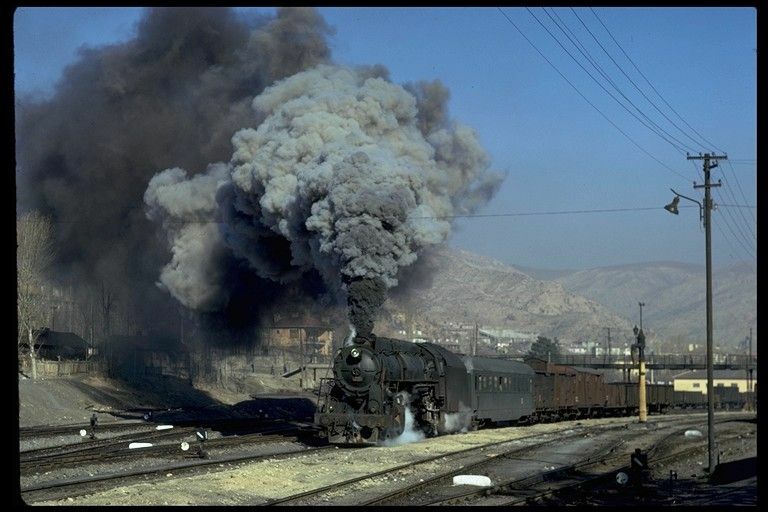 56347 leaving Çankiri 4 April 1974. 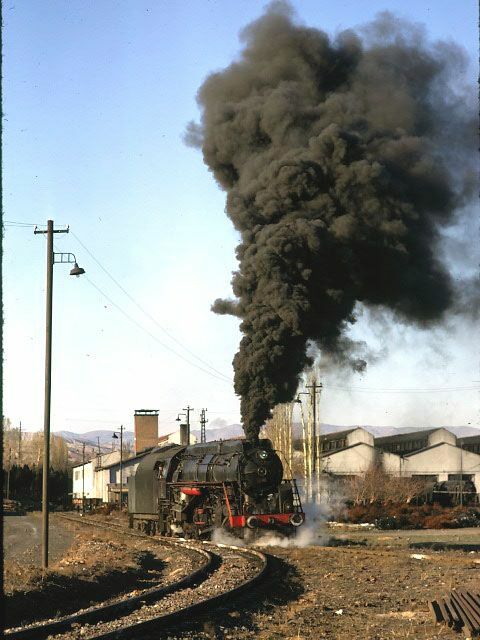 56347 panned near Germece 4 April 1974. 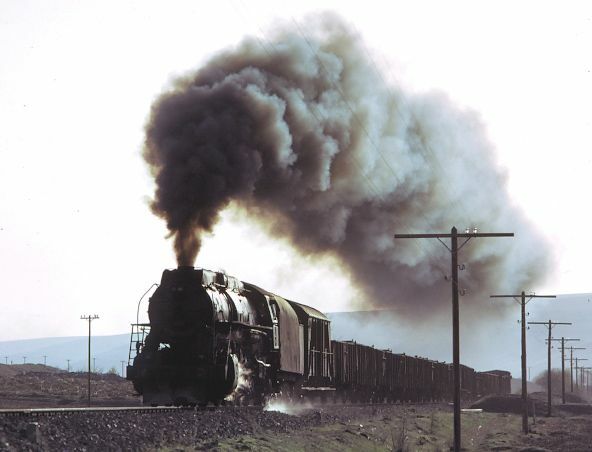 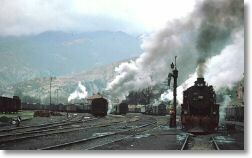 56347 near Germece 4 April 1974. 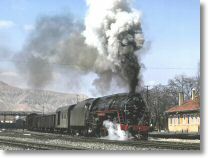 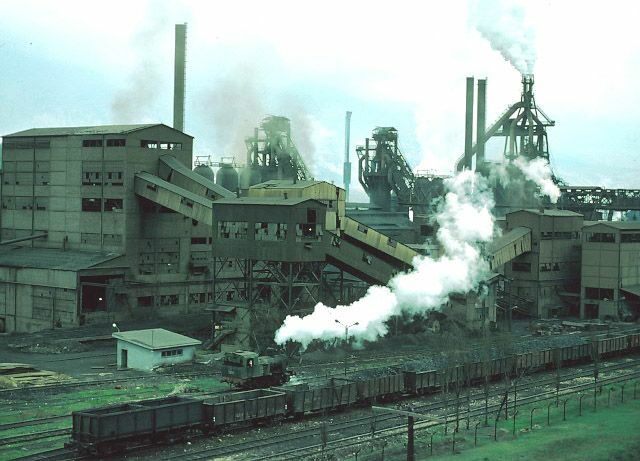 56347 near Tüney 4 April 1974. 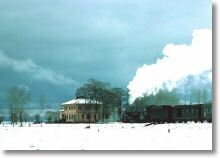 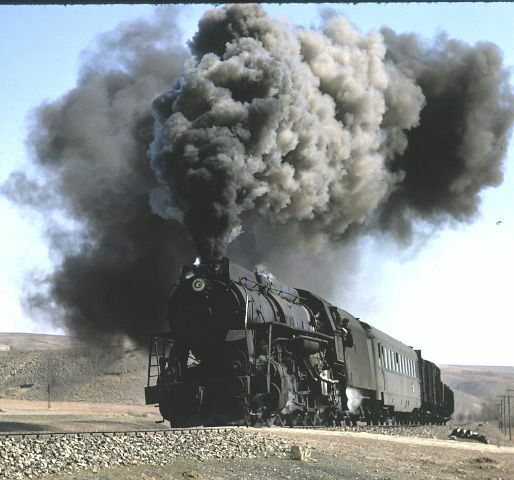 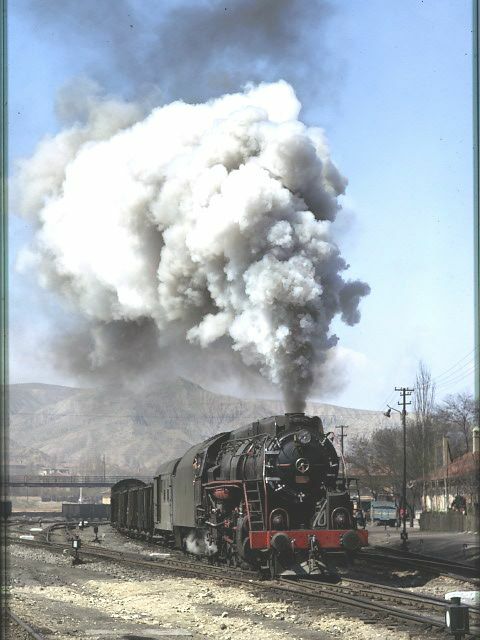 56347 near Tüney 4th April 1974. 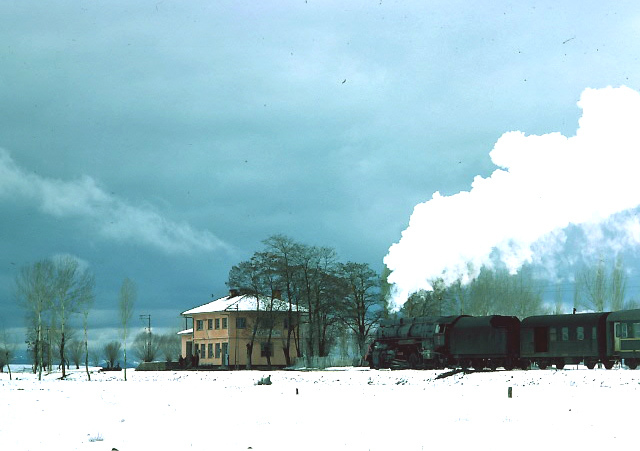 56355 near Tüney 4 April 1974. 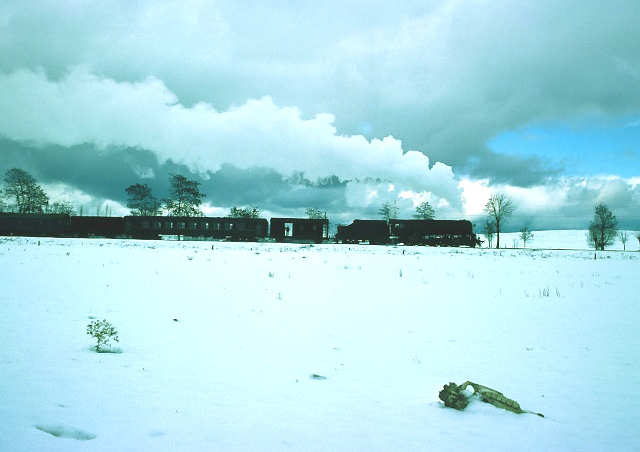 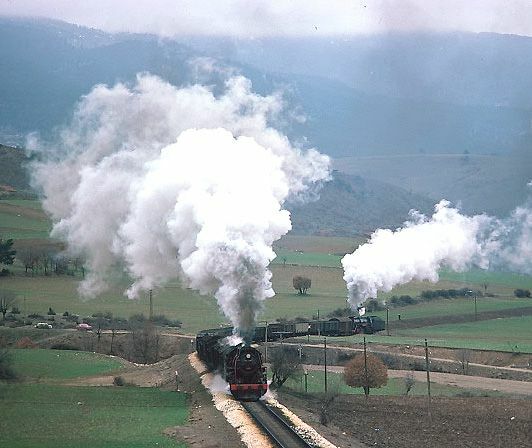 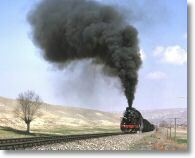 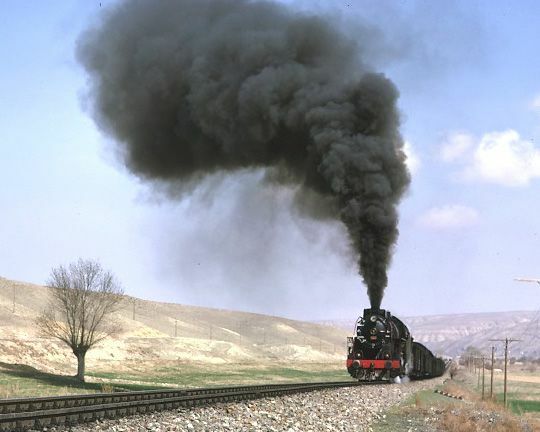 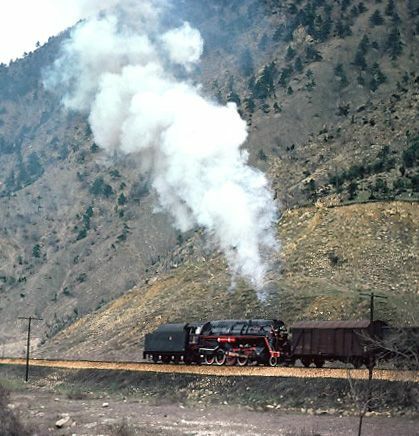 56347 between Kalecik and Irmak 4 April 1974. 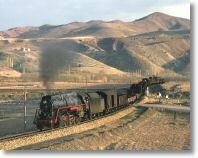 For some unknown reason we caught up the first train near Kalecik. 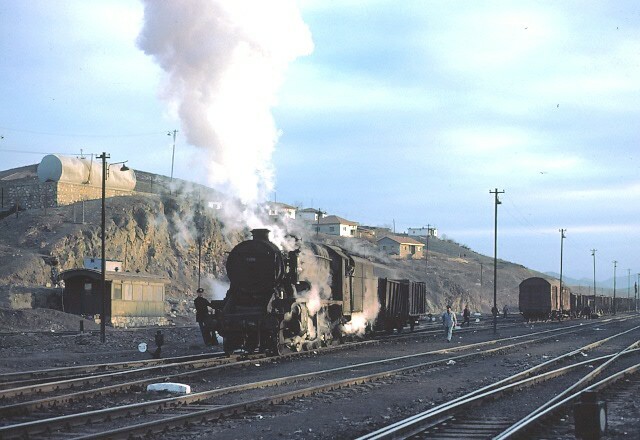 56347 arriving at Irmak 4 April 1974. 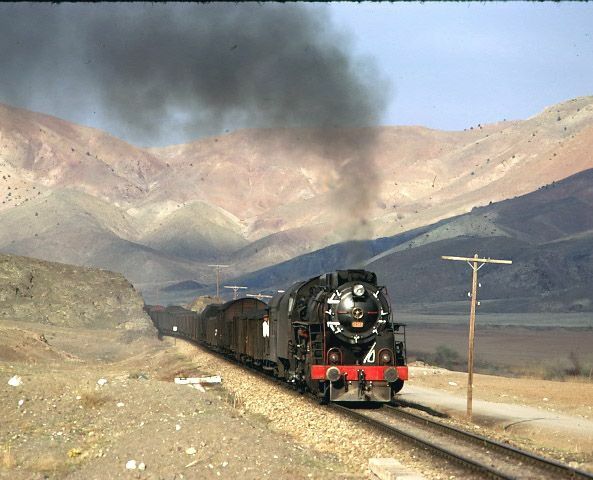 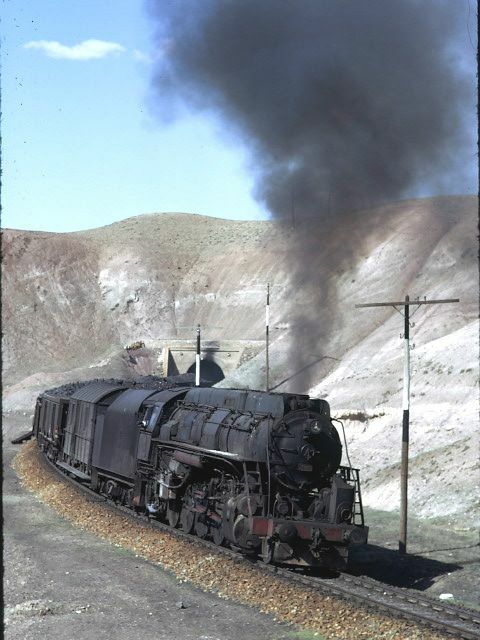 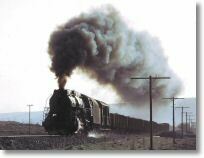 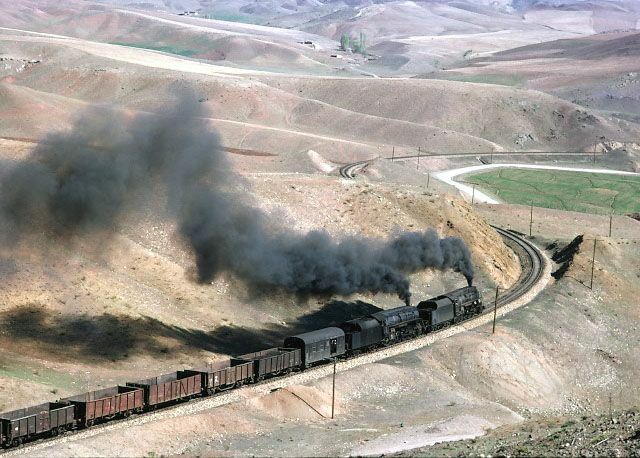 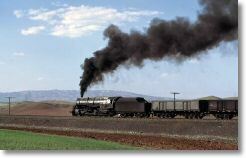 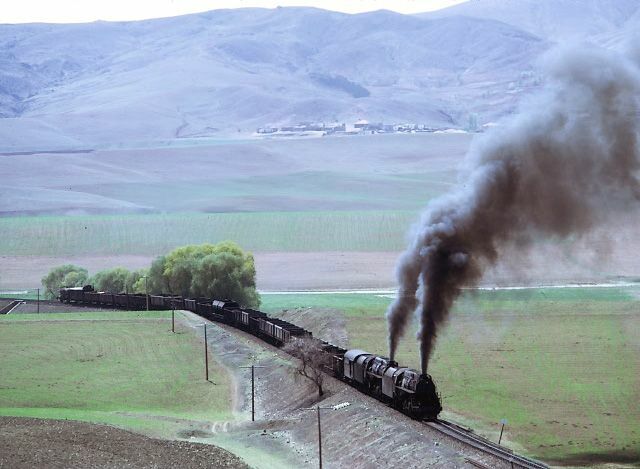 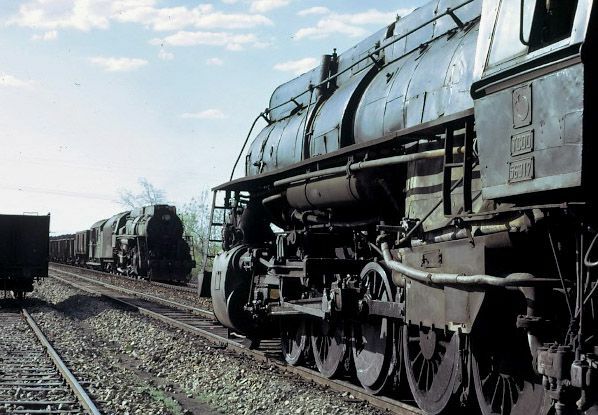 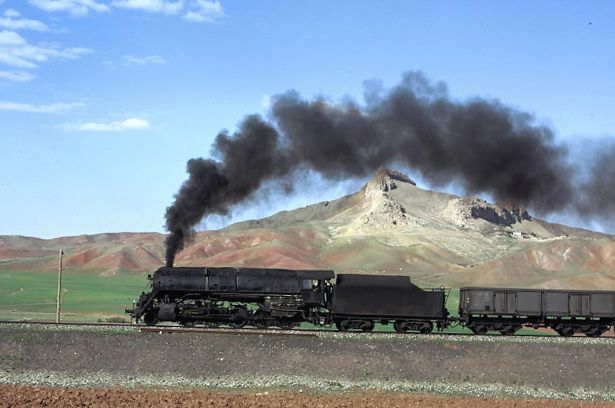 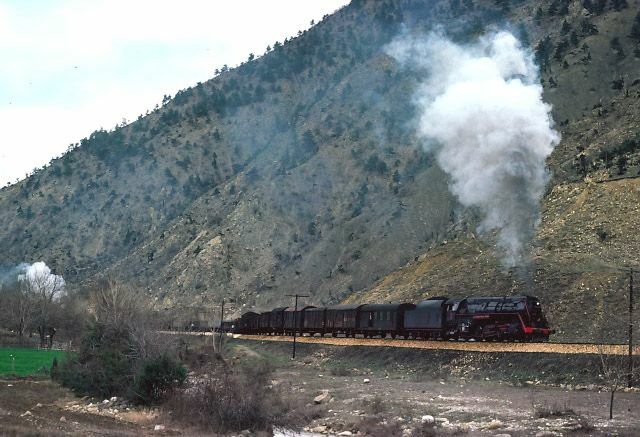 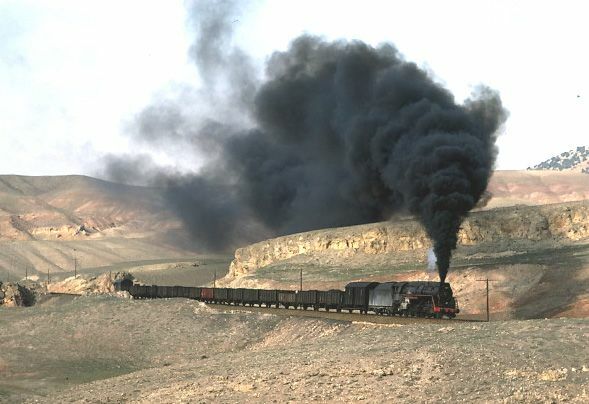 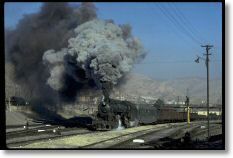 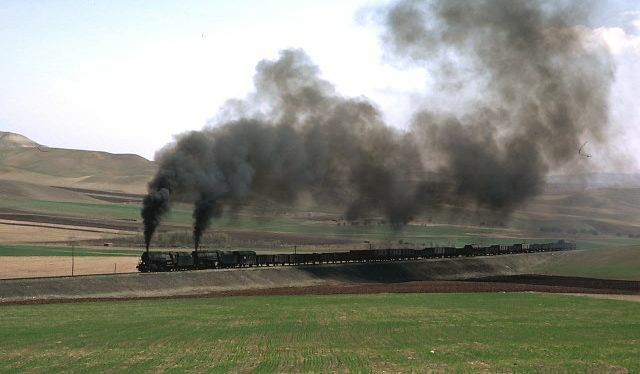 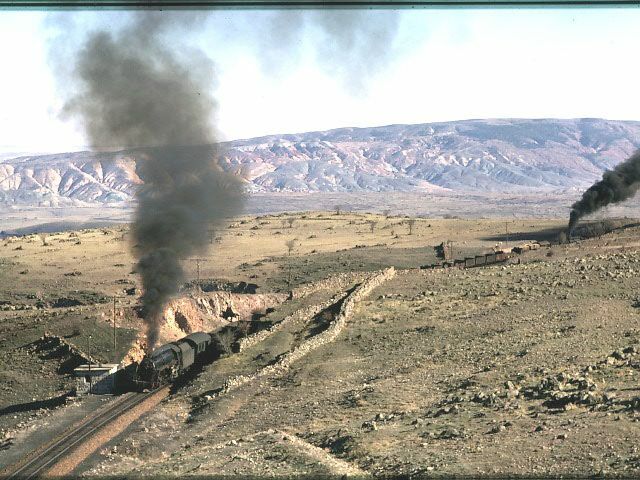 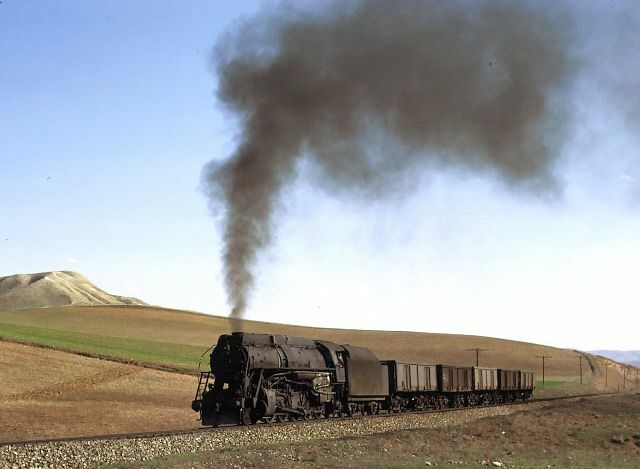 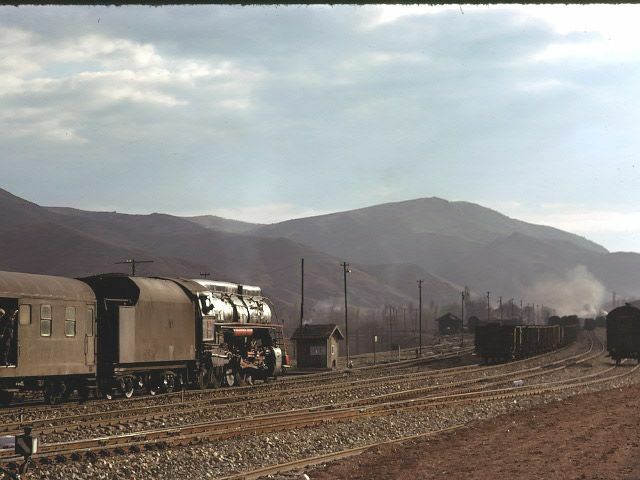 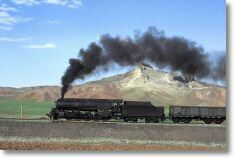 56337 heads north near Irmak 4 April 1974. 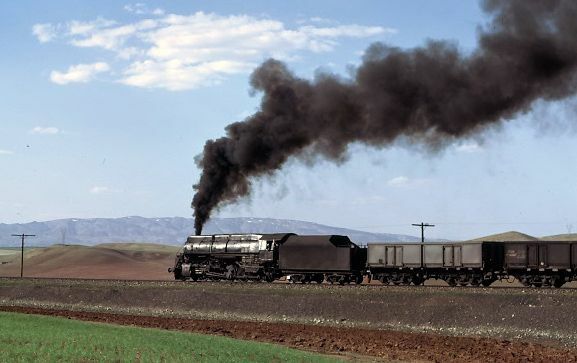 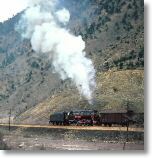 56317 north of Tuney 8 April 1975. 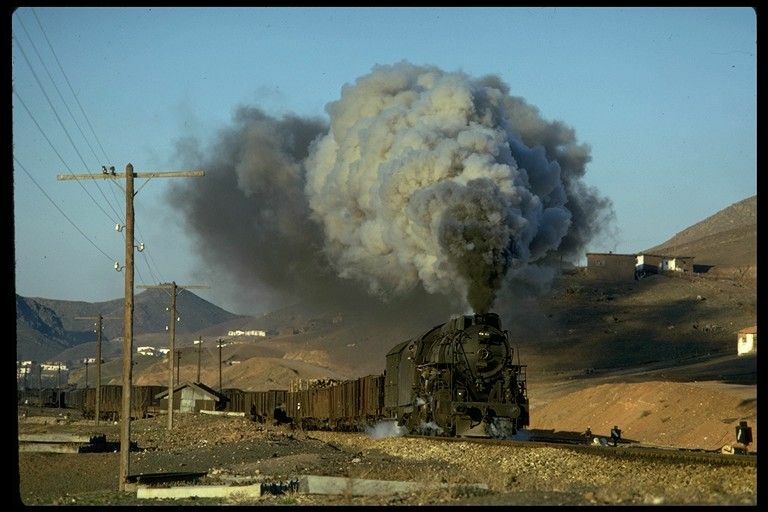 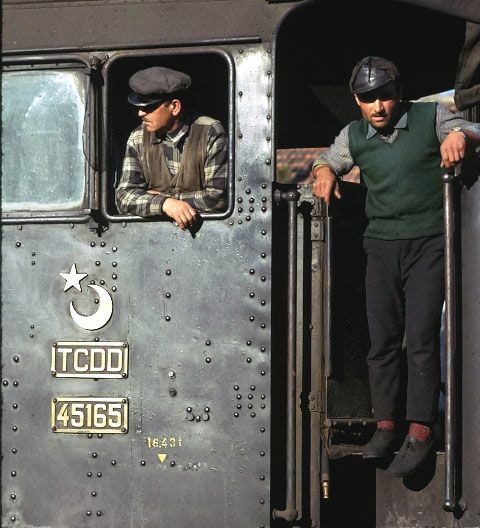 After the success of the first trip in 1974 another was planned for a week in April in 1975.The first train we found was a southbound Skyliner between Çankiri and Irmak. 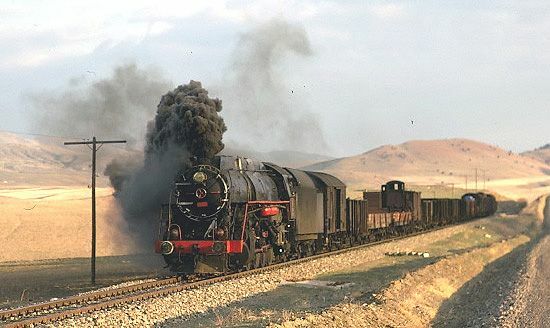 56317 entering Irmak 8 April 1975. 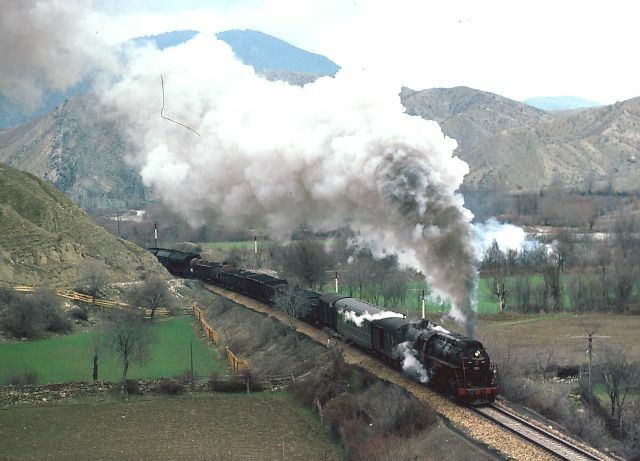 And the same train on the approaches to the junction at Irmak. 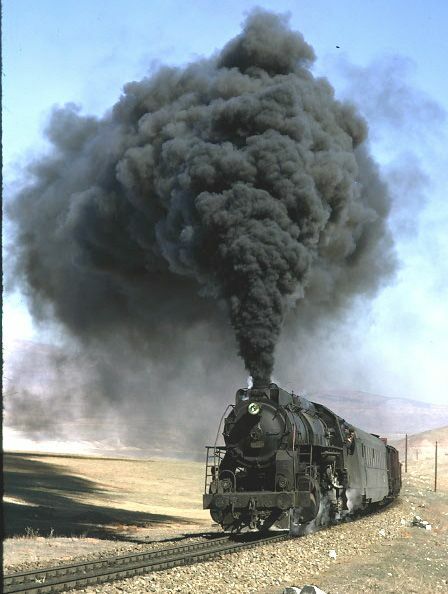 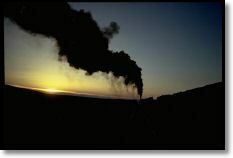 I was surprised to see such exhaust since the northbound trains at this point also work very hard. 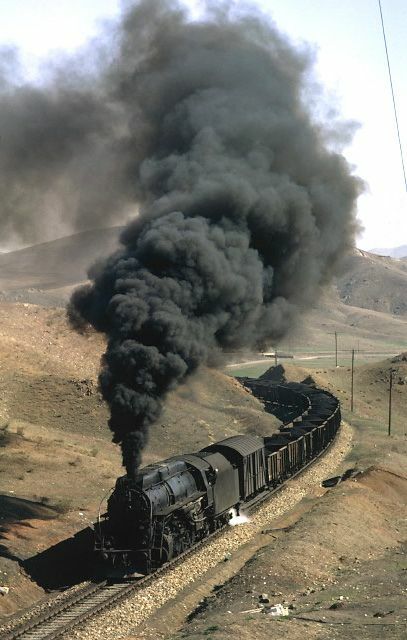 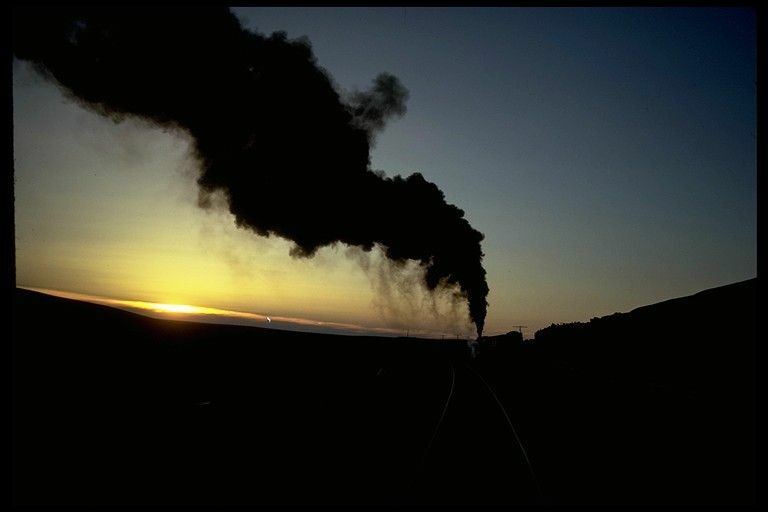 56317 south of Dumbelek 8 April 1975. 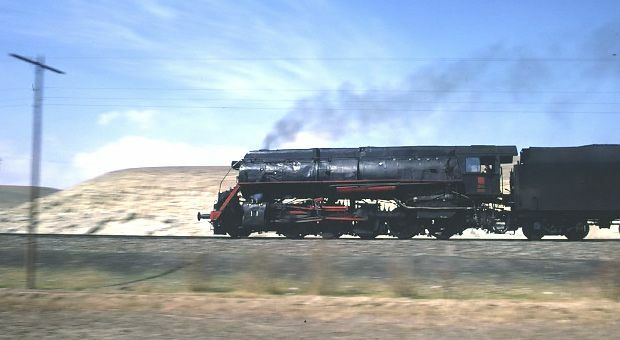 56317 south of Dumbelek 8 April 1975. 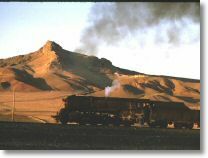 The loco left its train in the station at Dumbelek and returned southwards and eventually reappeared with this short train just before the sun went down. 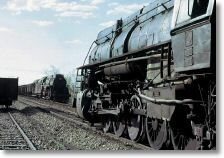 Very strange operation. 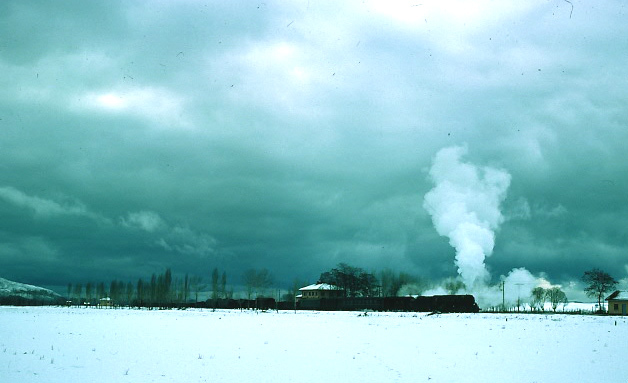 56317 south of Dümbelek 8 April 1975. 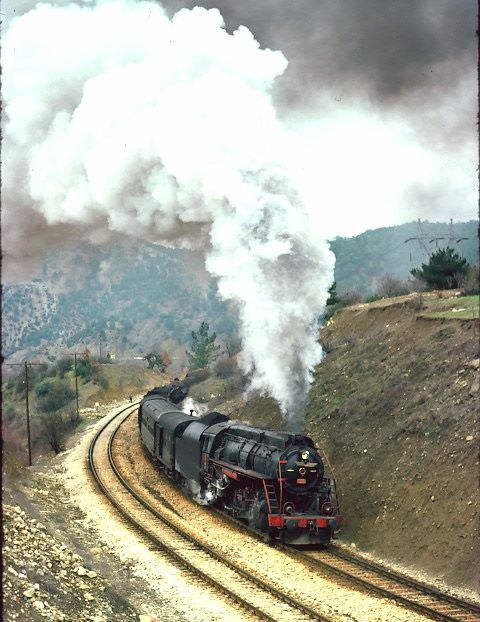 34008 at Karabuk 17 March 1977. 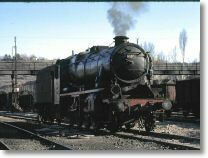 This picture shows where the additional axle was positioned between the rear two driving wheels, the plate work on the frames is just visible. 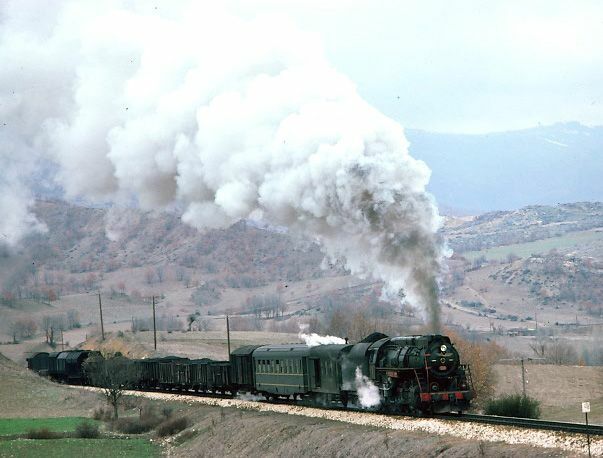 34008 at Karabuk 17 March 1977. 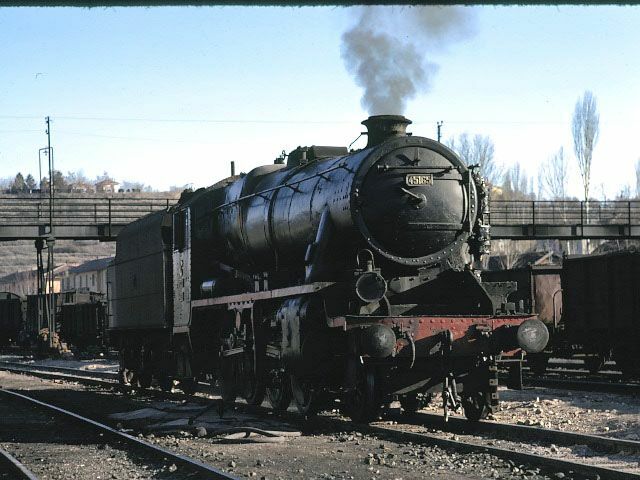 Not a bad return on investment for a 65 years old loco! 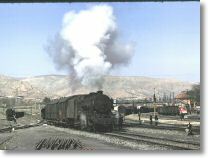 56345 between Eskipazar & Ismetpaşa 17 March 1977. 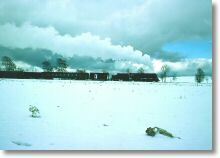 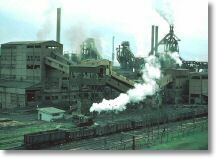 A poor picture but an excellent location which I sadly never returned to.